When it comes to decor in your home, what kind of shopper are you? I am a bargain shopper and I love my treasure-trove of great buys which I’ve gathered through the years. Whenever I find a good deal on one of my favorite items, I snap it up and store it. I have collected plates for all the great dinner parties I am going to throw someday. When I have time I am going to fill the many photo albums that are waiting to display my family pictures. And don’t even remind me of all the beautiful fabric that I have bought and stored around the house. I know that someday I will be snowed in for a month and I will sew and sew until I have used it all up. (Never mind that I live in the South and we rarely even get snowed in for two days!) Am I the only one that does this? Tassels are on my list of favorite things to collect. I love using them in many decor styles. They can be made from thread, shells, beads, ribbon or feathers. Small ones can be purchased for less than a dollar or you can spend hundreds on elaborate curtain tiebacks. They can give areas of your home a touch of interest with little effort on your part. Large tassels that are made for drapery tiebacks look great hanging from the back of some dining room chairs. Place the cord loop over each post on the chair and let the tassel hang down in the back. If your chairs are fabric you can tack them on with needle and thread. Small tassels can be attached to a ribbon and used as a bookmark. Place an open book with a tassel on an end table for a decorative accent. In your guest bathroom use cording and tassels to embellish the towels. A tiny one makes your favorite perfume bottle look even prettier. It’s always fun decorating with touches that are easy and interesting. 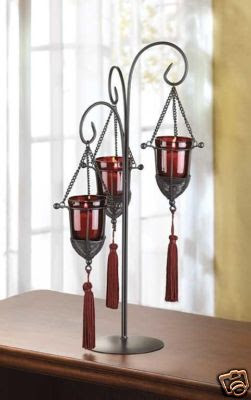 Tassels fit the bill perfectly for your home decor. You’ll always find great free ideas for home decor at my site below.